Nineteen DNCBers (names at end of this report) enjoyed a beautiful weekly Wednesday walk on the renovated trails of Maplewood Flats Conservation Area in North Vancouver. 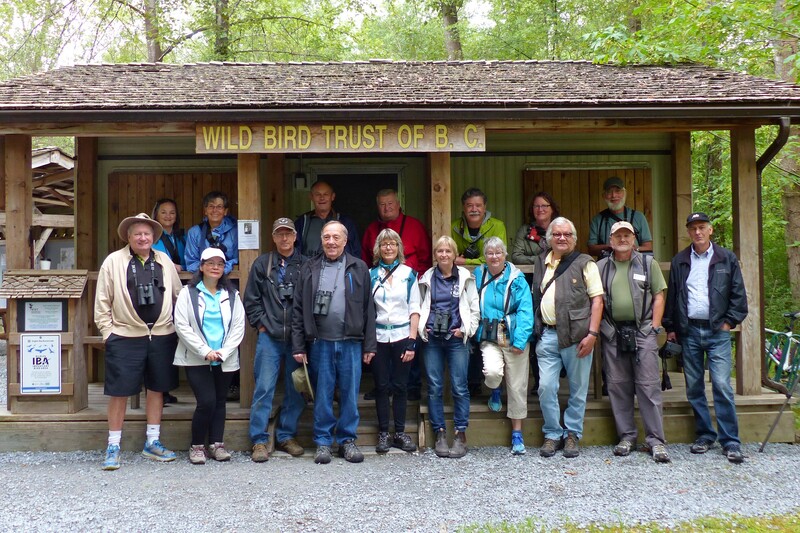 We were accompanied and led by renowned Maplewood’s expert, Derek Killby, a Director of the WBT Wild Bird Trust of BC. Pictorial evidence of the outing, including some beautiful flora shots, are on our DNCB Picasa site. Six of us car-pooled nicely in two vehicles (one electric) from Petra’s at 7:30 a.m. The ride was very slow and tedious, fighting morning traffic through Vancouver, so we arrived late at 8:45 a.m. at the park entrance and Welcome Hut. Derek and the other DNCBers were patiently waiting and had already seen the Miniature Huts and some neat birds (e.g. Swainson’s Thrush). Following introductions and Derek’s spiel, we started our walk through the woods toward the “flats”. Lots of singing birds but only common stuff (Chickadees, Towhees, Robins, Song Sparrows, House Finches) on this leg. At the shore, we saw the many Purple Martins hawking insects; Derek said most of the 95 nest boxes on the pylons are used so they’ll need more boxes added next year to accommodate this successful and growing colony. The resident Bald Eagle nest had two juveniles posted beside it. Lots of Canada Geese in the bay with a few Common Loons and both Pelagic and Double-crested Cormorants. One parent Osprey was on its nest on a distant pylon and we saw at least one baby via the scope. No migratory Ducks or Shorebirds around like we’re used to seeing here in the Winter, or even Spring and Fall. So we continued along the wooded trails in search of other birds. Both Tree and Violet-green Swallows around. We heard and/or saw a few Flycatcher species including Willow, Pacific-slope, and Western Wood-Pewee. Warblers seen (not by me, as usual) or heard were: Yellow, Wilson’s and Black-throated Gray. Most of us casual birders were content to get good looks at the Cedar Waxwings and entertaining Rufous Hummingbirds. Some DNCBers are getting very competent at identifying and photographing flowers and other plants, some of which are gorgeous; see photos on our Picasa site. We stopped at other lookouts and Derek often shared his wealth of knowledge of the area. An interesting sighting was a row of “sticks” in the bay that were put there as a weir to catch fish about 900 years ago by the Tsleil-Waututh First Nations people. At the bridge, there was no Kingfisher, but Derek’s tadpoles were an interesting substitute, along with a lone Garter Snake lying in a flower bed. An American Goldfinch was colourful, and we heard both Warbling and Red-eyed Vireos. I had a fleeting look at a Black-headed Grosbeak, and a Killdeer was our sole Shorebird seen. One of a few Band-tailed Pigeons hung around in a tree for a photo op arousing a bit of excitement. Northern Flickers and Downies were the only Woodpeckers seen. In the marsh area were several baby Wood Ducks and Mallards, while a pair of noisy Red-winged Blackbirds were in and out of their nest feeding young. We annoyed a pair of Tree Swallows trying to bring food to their young in a box right beside the marsh lookout. We got back to the entrance around Noon and thanked Derek for a brilliant and very interesting outing. On his direction, 12 of us drove to the nearby Narrows Pub for lunch. My Fish & Chips were tasty, and the “three” pints of beer were delectable too. However, the reason for the three beer was that we waited nearly two hours for our food orders, and some of our members walked out because their food had not arrived after two hours. Although the lengthy “birding bonding” was enjoyable, the frustration was unacceptable. However, a happy ending was that the Pub Manager apologized (short staffed) and complimented everyone’s food costs. You can’t beat a Free Lunch. I think it was a sluggish drive home but Anne didn’t complain about my snoring, as she and newbie Barb continued bonding. I got home at 4:00 p.m. which meant a longer than usual outing, but nonetheless another very enjoyable DNCB outing. Next Wednesday, June 29, our outing will be to Campbell Valley Park (CVP), leaving Petra’s at 7:30 a.m. Hopefully, around 8:15 a.m., CVP Expert Al Schulze will meet and lead the group from the 16th Avenue Entrance parking lot. I am having minor surgery on the 28th so won’t be participating. We 19 were: Chris McV drove Glen and Margaretha, Anne M took newbie Barb M and me Others met us there including: Rob & Marylile, Marion S, Richmond Brian, North Van locals Ray & Stormcat Paula and Richard H, Langley Tom with Alberta Jack, Maureen & Pat with their newbie friend Tiffany, and Maplewood Derek K. Misguided Lidia J called us from Campbell Valley Park, next week’s destination. This entry was posted in *DNCB, Band-tailed Pigeon, Maplewood Flats, Osprey, Pacific-slope Flycatcher, Red-eyed Vireo, Warbling Vireo, Western Wood-Pewee, Willow Flycatcher, Wilson’s Warbler, Yellow Warbler. Bookmark the permalink.